Custom Back Dangle Back Drop Necklace Crystals & Pearls Choker - Back Dangle Back Drop. Pearls & Crystals. Breathtaking Backs Collection. Crystals & Pearls Jewelry Handmade for Bridesmaid Wedding Evening Party & Brides. 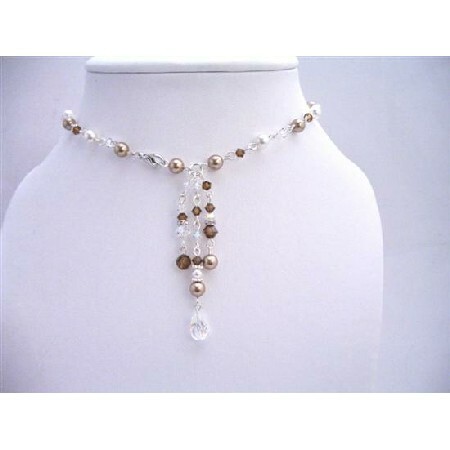 These pretty Swarovski Pearls & Crystals Necklace beautiful back drop down with Teardrop jewelry Set picture might not justify this dainty Necklace which is the perfect wedding accessory appropriate for brides members of the bridal party & guests. Handmade Exquisite Jewelry All A Grade & Swarovski Pearls Crystals Material are used to make this beautiful Necklace Earrings these are Not Glass Beads But 100% with 100% Guarantee Swarovski Pearls & Crystals.